It starts kind of slow, but bear with it. Because, after all, this book is about slowing down enough to recognize God’s reflection in all of creation—as well as in our own creations, as we too reflect the Creator. Steve DeWitt. 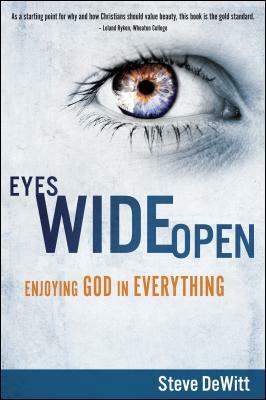 Eyes Wide Open: Enjoying God in Everything. 208p., $14.99, Credo House Publishers. My reiteration of the message from Steve DeWitt, senior pastor at Bethel Church in Crown Point, Indiana, is this: We are all creators, created in God’s image. And thus we are all image-bearers, gifted with image-ination. And most of us have lost that sense. But as we learn to recapture it, we also begin to better sense God’s presence around us in everything—even things we may have discounted previously or misused for our own purposes. That said, the first third or so of the book felt a bit obvious to me (and/or like transcribed sermon notes), and likely could have been condensed. But based on what follows, I suspect DeWitt’s intent was to make the access ramp as wide as possible before ramping things up. And ramp them he does. We find ourselves going from considerable overexposure to the word “wow!” (and my counteruse of the phrase “OK, I get it already!”) to practical suggestions on how to experience that “wow” for ourselves, drawing from sources as diverse and deep as Jonathan Edwards, St. Bonaventure and C.S. Lewis. As we apply the wisdom found here, we learn to use beauty as a catalyst for appreciating and worshiping God. Every created beauty that we have ever enjoyed in this world is like moonlight. Void of any comparison, they seem like the best this life has to offer. But through the gospel and the Holy Spirit, we have seen The Beautiful One, Christ…. We used to worship reflections, but through the gospel and the Holy Spirit we discern a better beauty…. Once we discern His glory, however, we enjoy the moonlight of created beauties all the more because they remind us of Him. From this point, DeWitt extends his exploration into our own outward expressions and explorations of beauty, addressing the issues of “What is Christian art, and is there even such a thing?” and our attraction to the power of story, which points to The Big Story. The book ends—where else?—with a moving look at the closing chapters of Revelation, where The Big Story, God’s glory and us are at last complete. And still only beginning. This book will get you on the road to seeing the Beautiful One, who creates all beauty, more fully. And it’ll even get you a ways down that road. This entry was posted in Uncategorized and tagged bethel church, book review, seeing God's beauty, steve dewitt, worship. Bookmark the permalink.